CHEQUE PRESENTATION: (from left to right) Betty Bethel, General Manager, Ministry of Tourism; Denise Adderley, Director of Marketing Services, Grand Bahama Island Tourism Board; and Kendra Clarke, Group Corporate Affairs Officer and Project Liaison, GBPA. Freeport Grand Bahama Island - The countdown is on. With only days to go before the 3rd Annual Ft. Lauderdale Film Festival on Location: Grand Bahama Island, organizers and sponsors of the event are tying up the final details, as festivities commence in less than a week. This year's event will feature a broadened High School Film Competition, which is being sponsored by The Grand Bahama Port Authority, Limited (GBPA). 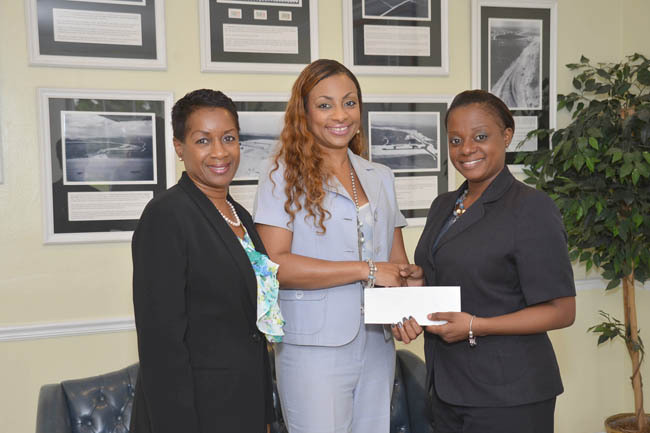 Project Liaison and Corporate Affairs Officer for GBPA, Miss Kendra Clarke made a cheque presentation to organizing officials from the Ministry of Tourism and the Grand Bahama Island Tourism Board, last week in support of the upcoming event. Clarke says the response from students island wide, has been overwhelming. "The Ministry of Tourism has done excellent work in spearheading this event for the past two years; so much so, that when the call for films was announced, we immediately began receiving submissions for the High School Film Competition,” Clarke noted. “I must say, it has been an amazing experience to see the level of raw talent, existing within our schools. The students have done phenomenal work and while there will be only one grand prize winner, they have all done a fantastic job on their individual submissions,” continued Clarke. On hand for the presentation was Ms. Betty Bethel, General Manager for the Ministry of Tourism. She shared that it has been MOT’s vision to secure more private sector support for the annual event. “It’s the ideal scenario because it is what we have been trying to do in Tourism, to get the private sector to own some of these initiatives that benefit the entire island with Government support,” Bethel stated. “That way we can guarantee sustainability of some of these initiatives. An opportunity like FLIFF lends to wider community participation for the youth who have an interest in the arts. Together we can do a whole lot more than individually,” she explained. The festival will take place in Freeport from October 31st – November 3nd at the Pelican Bay Hotel, in their state-of-the-art Canal House facility. FLIFF On Location: Grand Bahama Island is a collaboration between the Fort Lauderdale International Film Festival, the Bahamas Ministry of Tourism and Grand Bahama Island Tourism Board. The event has been made possible through the generous support of the following sponsors: Pelican Bay Hotel; TheBahamasWeekly.com; Mackey Media Ltd; Bahamas Celebration Cruises; The Grand Bahama Port Authority Limited; Grand Bahama Island Tourism Board; FLIFF; and the Grand Bahama Ministry of Tourism.